Steven Spielberg’s Ready Player One (B-) includes several moments of such unmitigated bliss that it’s a shame the full picture has a sloppy aesthetic, a cluttered and overlong story and utterly one-dimensional characters. It’s such a pop culture bonanza that it sometimes feels more like an incidental Comic-Con documentary than an actual feature film with a plot we’re supposed to relish. The intrepid director has a recent track record of rallying in the final sequences (“Didn’t you have a great time?”) but it’s a long slog cribbing plot elements of Wizard of Oz, Willy Wonka, Tron and more to tell the futuristic story of a teen trying to unlock three clues in a virtual reality game to win a life-changing fortune against evil corporate raiders of their own lost arc. Tye Sheridan and Ben Mendelsohn are wasted in the roles of the central players, with only T.J. Miller and Olivia Cooke getting standout moments as a wry animated bounty hunter and a spry revolutionary, respectively. There’s a wall-to-wall sense of nostalgia that culminates in a horror movie homage that is by far the best sequence. Otherwise the CGI is ugly and overwhelming and the action hollow with an undeveloped emotional core. This film should have been a magical sensation, but its user experience needed a bit more polishing. This mystical journey of meditation qualifies as a downward-facing dog. Despite tinges of uplift, Ava DuVernay’s adaptation of A Wrinkle in Time (D+) is a folly from the get-go, an interminable bore of pretentious drivel wrapped in a semi-shimmery package. Featuring bland line delivery rivaling George Lucas’s intergalactic prequels, inconsistent effects that miss the mark of even sub-Krull intentions and a meandering plot overestimating the cinematic drawing power of mathematical mind tricks, this sci-fi fantasy makes Disney’s similarly askew Tomorrowland look like a real people mover. Out-of-her-depth child actress Storm Reid can take no shelter or solace in the company of her adult co-stars as she is visited by three spirit guides (Oprah Winfrey, Reese Witherspoon and Mindy Kaling, each vying for “most cloying”) to help rescue her astrophysicist dad (Chris Pine, stripped of his usual charm) from interplanetary exile. Only child actor Deric McCabe shows some signs of life as a strange and sometimes sassy li’l bro, and frankly a little of him goes a long way. This film is ultimately a chore of the first order, tripping over its own tesseracts and leaning into a laborious labyrinth with very few joys aside from occasional Sade music. Substituting new-age banter for action or substance, the film feels like a fever dream by Enya, and I just wanted to sail away. Bottom line: Know that you’re special, and you had the power in you all along; and you can spend two hours saving your world in a different way. Writer/director Alex Garland’s Annihilation (B) is largely an incredibly absorbing sci-fi thriller about an army of women who venture behind a quarantined force field to resolve the enigma of the atmospheric abnormality going on inside. Natalie Portman is solid as the former military biology professor with a secret who discovers many of the chilling mutations and mysteries within “the shimmer.” The story is often hypnotic and the effects impressive, but the movie runs into some final act troubles. Some of the key characters are also underwritten, and there are myriad missed opportunities to more clearly articulate the film’s thesis, involving our cellular imprint toward self-destruction. The film is still smarter than your standard issue adventure, and like Christopher Nolan’s similarly ambitious Interstellar also overextends its reach. Alexander Payne pushes more buttons than audiences may expect in his new human miniaturization movie; it’s par for the course for the midwestern provocateur. This skilled writer/director blends physical pratfalls, witty wordplay, social satire, wicked parody and almost every conceivable flavor of comedy for the deliriously inventive and surprisingly highbrow Downsizing (A-). Matt Damon is in full sad-sack mode as a nebbishy Nebraskan hoping to please his materialistic wife (Kristen Wiig) by signing them up for an experimental planned community in which citizens are shrunk to live in dollhouse-sized McMansions in a sunny country club suburbia called “Leisureland.” Christoph Waltz shines as a wee rogue defying the new community’s evolving rules, and Hong Chau is a revelation as a compact freedom fighter and humanitarian heroine. Both get absolutely delicious dialogue commenting on class issues prevalent in the upstairs and downstairs of even the tiniest of houses. Two of the film’s themes – to look closer and to take good care of the part of the world that you can affect – are developed to staggering impact. A few central plot points are jettisoned or careen off course a bit as the stakes are raised beyond simply the fates of the film’s pint-sized protagonists. There’s so much more to this comedy/drama/sci-fi hybrid than meets the eye, and it is heartily recommended for the intellectually adventurous. Denis Villeneuve’s Blade Runner 2049 (B-) continues the slow-burn neo-noir dystopian atmosphere of Ridley Scott’s 1982 predecessor and flips the script on some of the motifs about androids (“replicants”) being able to approximate human emotions. Handsomely produced with mesmerizing imagery and endowed with a good-looking cast of characters sorting out future L.A. life a few decades after the events of the original, the film succeeds in moments of discovery and drags when presenting indulgent sequences of exposition. This time Ryan Gosling is the “blade runner” (rogue robot hunter), and the way his character is written doesn’t do him many favors. Harrison Ford is back in what amounts to a brief cameo and doesn’t bring much either. There’s a subplot about family secrets, a nice bit about how embedded memories are made and some twisty surprises that up the ante, but the film definitely short circuits in the final act. The first film was an efficient mystery and action thriller. It was ponderous too but delivered the goods on action, which this installment does all too infrequently during its near three-hour running time. This sequel looks spectacular on the big screen. I just wished it dreamed with a little more electricity. If you’ve ever felt like the late-night denizens on a bender in your neighborhood bar or Uber pool could be as destructive to urban life as Godzilla, Mothra or a Giant Robot, you’ll find comfort in Nacho Vigalondo’s Colossal (B-), a hit or miss sci-fi fantasy with grander repercussions than are actually explored on screen. Anne Hathaway plays against type as a flighty NYC writer perpetually experiencing alcohol induced blackouts. Coinciding with her rural reboot to her childhood hometown, a worldwide panic breaks out with a gigantic monster appearing in Korea, and our protagonist and the creature just may be connected. Hathaway solidly anchors a far fetched and somewhat plot hole laden experiment with a tinge of a theme about the ripple effects of domestic squabbles and their unintended consequences. It’s a good thing the film’s undercurrents lean a bit on the feminist since the men in the ensemble including Jason Sudeikis, Dan Stevens and Tim Blake Nelson are fairly dreadful. The effects are impressive for what seems like a cult indie. Ultimately, it wasn’t quite an OMG when I was hoping it would at least be a BFG. There are few phenomena more fascinating in Hollywood than a sophomore slump. And for Norwegian director Morten Tyldum, who was Oscar nominated for his first English language feature (the brilliant biopic The Imitation Game), the fact that his follow-up flail is Passengers (D) must be some cosmic poetic justice of miscalculation. In terms of extremes, there’s rarely been as handsome a physical production – all art deco parlors, digital automats and infinity swimming pools overlooking a galaxy – so sullied by such a misbegotten story. (Note: I’m not sure if something is a spoiler if it’s laid out in a movie’s first twenty minutes, but this film is different than advertised; so read on at your peril). The tale of a lonely mechanic (Chris Pratt) accidentally awakened from hypersleep and adrift as the only man left in a spacecraft on a near century-long voyage who wakes up a sleeping beauty (Jennifer Lawrence) to keep him company knowing full well that reanimating her is sentencing her to death has to be the worst Meet Cute in the history of cinematic love stories. Pratt employs his goofball everyman humor in an attempt to wrestle likability from an impossibly written character. His unfortunate portrayal is akin to Bill Cosby making his Pudding Pop funny-face while readying a shiny platter of roofies. Lawrence fares only slightly better as an author who gets more than she bargained for; after Joy last year, we’ve come to expect this prized actress to cook up a holiday turkey. Unsure of whether it’s an Adam and Eve story with the betrayal placed before the couple could even discuss it or Titanic with rohypnol instead of the blue jewel, Tyldum’s “very special episode” riff on sci-fi is a colossal catastrophe of an idea. The two to three times when the movie’s tone careens into romantic montage or adventurous befuddlement are rare respites in a tale not unlike Dr. Lecter’s drug-hazed final act of seduction in Hannibal. Careers will survive this, and the two principal matinee idols are gorgeously filmed, but Passengers isn’t what space pioneers meant when they promised to boldly go where no one has gone before. Every couple of years, directors as diverse as Steven Spielberg, Ron Howard, John Sayles, John Carpenter, Robert Zemeckis and Christopher Nolan add to the pantheon of films addressing making contact with alien life. The notion of actually communicating with interstellar visitors, so memorably celebrated in five iconic music notes in the finale act of Close Encounters of the Third Kind, sets the stage for serious modern films tackling this task of translation, but Denis Villeneuve’s cerebral science fiction drama Arrival (A-) radically riffs on a familiar tune with a stunning viewpoint and sustained atmosphere that remixes a well-worn genre. The Canadian director follows successful crime thrillers Prisoners and Sicario with an all-out orchestra to the outsider, exploring what it means to be imbued with preternatural power to alter the course of human events or perhaps even bend time if only the universal ability to understand one another is possible. After twelve mysterious UFOs begin hovering over world cities, the U.S. military recruits a linguist masterfully played by Amy Adams to assist in making sense of alien communication. What follows is a deliberately paced, at times puzzling and consistently revealing opus on the phenomenon of language and science as bridge builders to deeper understanding and community. Adams thoroughly dominates the film and is engrossing and believable in showcasing her convictions and discoveries. Jeremy Renner is successful at playing her supporting scientist, the kind of role typically reserved for a love interest, but there’s scant time for romance when the world is at stake. The film’s effects – striking and unusual – buoy a thinking person’s meditation on big issues of international and cosmic collaboration. The kindest accolade of all is that the film inspires a desire for repeat viewing and discussion. An absurdist sci-fi fantasy, a cunning comedy and a metaphorical meditation on the oddities of being a single person on the planet earth, Yorgos Lanthimos’ The Lobster (B) is a beguiling think piece that both advances the contention that Colin Farrell has become one of film’s great comic actors (a great companion piece to In Bruges) and the notion that a puzzle of a movie can still be a jigsaw short of its razor-sharp intentions. Farrell plays a sad-sack single who checks in to a rigorous retreat center where guests either pair up with a companion based on a very superficial physical trait or permanently transform into an animal. This droll, deadpan fable is largely able. Alas the episodic structure doesn’t provide much of a compass to guide viewers to where this is all heading (nor does the ending); but like Her, Gattaca or Dogville, it follows some intriguing internal logic. The dark comedy largely delivers; and even with some final act problems, it is a remarkable production that will stimulate discussion. Farrell’s fussy scruffiness, the craziness of his road to wellville and some fierce supporting characters (Ariane Labed as a hotel maid, Ben Whishaw and John C. Reilly as fellow guests at the recovery residence, Léa Seydoux as a freedom fighter and Rachel Weisz as a mystery woman) buoy this indie original. Told with sincerity and cerebral grace, Jeff Nichols’ Midnight Special (B+) upends many conventions of the sci-fi and supernatural genres to deliver a memorable tale. Michael Shannon is highly effective as the father of an otherworldly child (Jaeden Lieberher) and along with a buddy nicely played by Joel Edgerton is secretly transporting the precious kid cargo from a religious sect in time for some sort of day of reckoning. With Sam Shepard in a small role as leader of a cult, Kirsten Dunst as the child’s estranged mom and Adam Driver as a preternaturally wise government agent, it’s unclear if we’re preparing for abductions, alien invasions or the rapture itself. Nichols sustains a slow-burn tension and a desaturated color pallet through most of the journey and employs very few special effects, aside from the kids’ light beam eyes that look like lens flairs that would be the envy of J.J. Abrams. The story leaves a variety of unsolved mysteries but will appeal to fans of M. Night Shyamalan’s early work. The acting is so subdued that you almost yearn for someone to go a bit nuts, and the one-note child performance leaves us a bit wanting. But the film will reward fans who appreciate the indie treatment to this kind of story. Slow and cerebral but definitely worthwhile viewing, Alex Garland’s Ex Machina (B) is a fascinating drama about a meek computer engineer (Domhnall Gleeson) lured to the secluded home of the reclusive head of his tech company (Oscar Isaac) to interrogate a gorgeous cyborg (Alicia Vikander) he has created. There’s an air of mystery and oneupsmanship among the central actors and an eerie romantic chemistry between Everyman and A.I. Creation. Deft performances, well integrated effects, moody lighting and interiors and a general atmosphere of foreboding add up to a chilly and austere experience. Many of the themes here have been more vividly explored in superior films, but this heady chess game is an unexpected entry into the sci-fi cyber-canon. Disney’s history of imagination is unparalleled, but the studio’s shaky track record of sci-fi is paved with the likes of The Black Hole, The Computer Wore Tennis Shoes and Tron Legacy. 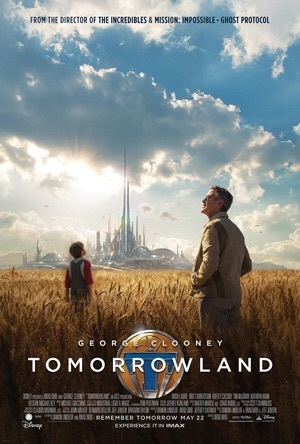 So the squandered opportunity for redemption is mighty in Brad Bird’s Tomorrowland (C-), an ambitious film that is full of ideas but misses the mark on executing most of them. The vapid protagonist played by Britt Robertson speaks mainly in cliches, and when she partners with George Clooney in what is basically an extended cameo, he doesn’t add much either to the proceedings aside from faux Han Solo gruffness. There’s lots of overreach about saving mankind from its own destiny, but Bird doesn’t do a good job outlining the plot to properly take audiences along for the ride. What’s left are a few lovely nostalgia scenes, some half-sketched visions of the future, some awkward robots (TV’s Small Wonder was more believable) and an underdeveloped sense of majesty. The film, overstuffed with good intention, is mostly a bloated bore.